…begins back in 1993 when we were just nine and eleven and our mother assigned us the summer project of growing potatoes. Being ambitious farm kids we planted a quarter acre of twenty varieties. Each year our plot expanded and with it our dreams of becoming ‘real’ farmers in our own right. Soon our farm-kid ambition had us buying potato planters and tractors and hiring our mother to drive us to the Dane County Farmer’s Market. The rest is history. What began as a summer project has now taken the shape of our dreams. We manage over 100 acres of ridge and valley fields in the enchanting Driftless region of Southwest Wisconsin. Our farm is called Driftless Organics and beyond our legendary potatoes, we produce fruit, vegetables and sunflower oil that we share via farmers markets, grocery stores and with Community Supported Agriculture (CSA) members throughout the upper Midwest. 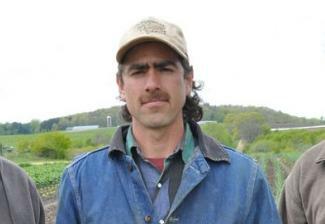 Josh Engel was born and raised in rural Soldiers Grove, on his parents’ organic dairy farm. He started growing potatoes when he was 11 years old and hasn’t looked back since. Josh is the brain child of Driftless Organics’ famous sunflower oil and has been instrumental in bringing biodiversity to the farm in the form of small grains, biofuels and other edible-oil crops like pumpkin seed and canola. Josh also runs the wholesale wing of the farm, communicating with over a dozen produce buyers all across the Midwest; and coordinating the delivery of all of the produce that Driftless Organics grows. In addition, Josh helps manage the various crews and keeps things ticking in the office as well. Whew! With all of that AND helping to raise a family with his wife, Teresa and son, Otto, it’s a wonder he gets any sleep at all! Like Josh, Noah Engel was also raised on one of the area’s first organic dairy farms. Since he was old enough to walk, Noah has been working with and around tractors. To this day, tinkering in the shop is his first and foremost passion. From cultivation equipment to our harvest machines, Noah is the one building, fixing and managing it all. Noah is also in charge of the farm’s many “systems”, including our vast network of irrigation lines and our vegetable washing and pack lines. 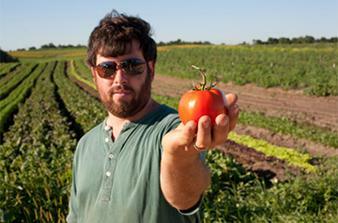 In addition to all of this, Noah’s manages all of the mechanical weed control on the farm. He helps with the nutrient management and oversees the “big” mechanical harvests of crops like carrots and potatoes. I’m sure there’s about a thousand other things that Noah takes care of at Driftless and as you can see, he’s a busy guy! Noah lives in town with his wife, Ximena and their two boys, Yasmani and Rafael. He also coordinates our Viroqua CSA pick up site at his house.